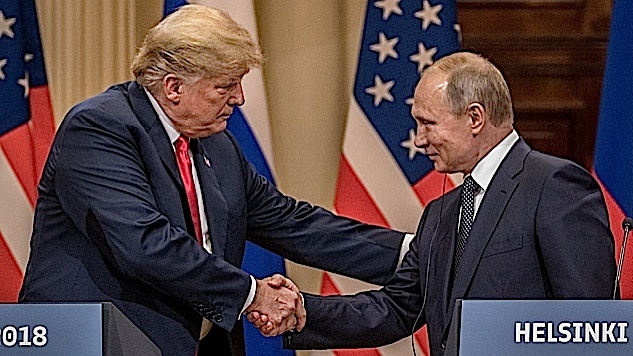 Let’s cut to it: Donald Trump, in his press conference following his private two-hour meeting with Russian President Vladimir Putin, revealed in front of the world that he’s a traitor to the United States. Mueller’s play last Friday to indict 12 Russian military officers in the attack on America, bulwarked with an extraordinary amount of detail about how that attack was carried out, couldn’t have worked better. Trump, now pinned to the facts about Russia (not about Americans involved), was asked to explain his position on that indictment and whether he believes the information from his intelligence agencies (or the House Intelligence Community, for that matter) or Putin’s denial. Trump then said, for the first time, that he believes Putin: “I don’t see any reason why it would be” Russia. “I think we’re all to blame,” he added. Putin, meanwhile, when asked directly, didn’t deny having compromising material on Trump or his family. President Trump, in a stream of vituperative logorrhea reminiscent of Alex Jones or, perhaps more appropriately, some of the most unhinged of his own supporters, rambled through conspiracy theories about the Mueller investigation, allusions to a “Pakistani gentleman” that no one outside of right-wing conspiracy theorists and conspiracy theorist watchers will understand, attacks on Hillary Clinton, and a defense of his electoral college victory. 2. Trump just said he has “no reason to believe” his U.S. intelligence community’s analysis. He refused, on camera, to condemn Russia for the attack, and instead attacked his own government. In other words, Trump is aiding and abetting and giving comfort to an enemy who, by the analysis of people Trump himself appointed to lead the intelligence community, is currently attacking the United States. The conspiracy never ended. He’s “colluding” in our faces. It’s disgusting—physically sickening—and it shames the United States and our elected Republican representatives who, if they don’t act now, are unmistakably complicit. - Trump opened by saying, “Our relationship has never been worse than it is now. However, that changed. As of about four hours ago.” He blamed part of the bad relationships not on Putin’s invasion of Crimea, his interference in Ukraine, his downing of a civilian Malaysian airliner over Ukraine, his multiple poisoning attacks in the U.K., his gross human rights record, or his abuses of the press and crackdowns on political dissident…but on the Mueller investigation. - Trump and Putin agreed there was no collusion. - Putin didn’t deny he has kompromat on Trump. - Putin gave Trump a soccer ball, which Trump then tossed to Melania. - Putin admitted he supported Trump in the election. - Trump said Putin “has an interesting idea” about what to do about the election attack, but he didn’t offer details. Putin, however, did, saying he’d be willing to invite Mueller’s team over to observe Russian interrogations of the men Mueller accused of the attack. This isn’t a gift, however: “We’d expect the U.S. to reciprocate” and have U.S. law enforcement invite Russians to observe interrogations of American citizens Putin accuses of breaking the law in Russia. You have groups that are wondering why the FBI never took the server. Why haven’t they taken the server? [Ed. : They don’t need it physically. They imaged it. Mueller did examine the server, and cited the server in this week’s indictment.] Why was the FBI told to leave the office of the Democratic National Committee? I’ve been wondering that. I’ve been asking that for months and months, and I’ve been tweeting it out and calling it out on social media. Where is the server? I want to know where is the server and what is the server saying? ...I have President Putin, he just said it’s not Russia. I will say this: I don’t see any reason why it would be, but I really do want to see the server. But I have — I have confidence in both parties. I really believe that this will probably go on for a while, but I don’t think it can go on without finding out what happened to the server. What happened to the servers of the Pakistani gentleman that worked on the DNC? Where are those servers? They’re missing. Where are they? What happened to Hillary Clinton’s emails? 33,000 emails gone, just gone. The press conference also touched briefly on policy issues, such as Syria and trade. Putin, however, also said he wanted to separate Israeli and Syrian forces. “This will bring peace to Golan Heights, and bring more peaceful relationship between Syria and Israel, and also to provide security of the state of Israel.” This also happens to be exactly what Iran wants, and will give Assad more room to brutalize on his own people. Trump offered no specific plans there.